Mission Bay, San Diego is an oceanfront paradise blessed with a refreshing breeze, serene waters, powdery beaches and consistently pleasant weather in every season. This naturally beautiful region magnetically draws recreational enthusiasts year round and is perfectly placed only minutes away from downtown San Diego. 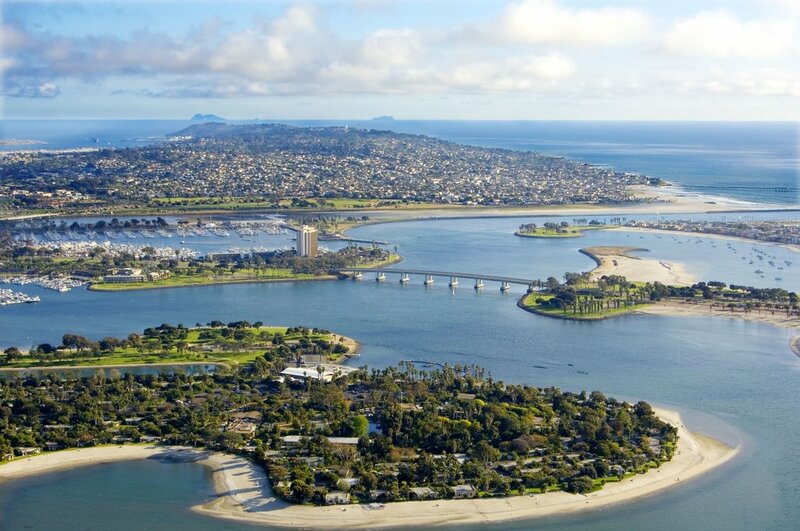 It’s also home to Mission Bay Park, a 4,600-acre aquatic playground the likes of which you will find nowhere else in the world. Twenty-seven miles of rambling shoreline envelope the park and include a diverse collection of waterways that adventurous travelers may choose to explore. The Conscious Connection team was visiting for the Sustainable Brands Conference and we got to experience the full splendor of the area through a variety of our hotel partners. In addition to breathtaking views, we enjoyed a variety of water sports, such as laid-back stand-up paddle boarding and early morning surf sessions. Mission Bay San Diego offers something for all ages and skill-levels to enjoy in the water. While on land, families can enjoy a picnic, barbecue or celebrate with bonfires right next to the water as well. Our first stop in Mission Bay was the Hyatt Regency, the premier luxury hotel in San Diego. The Hyatt Regency Mission Bay Spa & Marina offers incredible amenities, easy access to San Diego attractions and impeccable service from a courteous staff. The Conscious Connection room provided a gorgeous view of the entire bay area, with luxurious balcony chairs and a front row seat to epic Pacific Ocean sunsets. The eco-friendly Hyatt Regency in Mission Bay also features a full-service spa, water taxis to SeaWorld and an award-winning pool where you can relax and watch the boats go by in the marina. After a long day of exploring just some of the exciting activities and sights that San Diego has to offer, you can satisfy your senses with stylish cuisine in a classic California setting before you retire to your suite and sink into a plush Hyatt Grand Board™. Business travelers are treated to 32,000 square feet of creative, flexible indoor and outdoor function space and a new signature restaurant with private group dining options directly on the waterfront. You can keep your stay at this lavish San Diego hotel stress-free and relaxed by taking advantage of convenient services like the E-Concierge and Hyatt Fast Board™. Their knowledgeable concierge staff will readily make your arrangements for visiting San Diego’s most favored attractions, plan an evening on the town for 2 to 22, or deliver a special service to you as a VIP guest before you arrive. They even compensate for the most common mistakes stressed travelers tend to make. If you’ve forgotten anything, they will gladly bring any item directly to your room to borrow free of charge. This was particularly helpful when we left our phone charger in Encinitas and needed a steamer to press our suits! We then proceeded to the Dana Hotel on Mission Bay directly on the waterfront. This commodious hotel is the ideal choice for families heading to San Diego and looking for the best lodging near SeaWorld and the boat docks at Mission Bay. With its picture-postcard beach resort setting on Mission Bay, The Dana Hotel can provide all you might require for the perfect stay — whether it be a vacation, business engagement, or special event. Location is indeed everything. The Dana on Mission Bay by SeaWorld is nestled among ten tropically landscaped acres in the heart of San Diego’s Mission Bay Aquatic Park. The Dana on Mission Bay is the closest San Diego hotel to SeaWorld and offers complimentary shuttle service to SeaWorld daily. It is convenient to all of San Diego’s major attractions, including the San Diego Zoo, Balboa Park, Downtown San Diego’s Gaslamp Quarter and more. Positioned less than a mile from the beach and Belmont Park, this hotel will please even the most frugal family. For those seeking a relaxed and comfortable setting that’s just as spectacular as the beach, The Dana includes two sparkling pools and spas set in a tropical recreation area. You can wile away the day soaking up the Mission Bay view while you unwind by the Bayside Pool, or even rent a pedal boat or kayak from the hotel’s water sport rental facility and take a sight-seeing journey through the bay. Their accommodating Guest Services staff will readily make arrangements for tours, dinner reservations, attraction tickets, and much more. The Hilton San Diego Resort & Spa is situated on the beautiful shores of Mission Bay and is central to all of San Diego’s leading attractions. This 18-acre utopia of recreation is just six miles from San Diego airport and one mile from SeaWorld. The Hilton is located in close proximity to the famous Gaslamp District and La Jolla as well, which is only a 12-minute drive away. We were able to take advantage of an array of on-site services, such as Mantra “The Art of Spa”, a full service marina, a chic fitness center, urbane guest rooms, plus seasonal live music you can enjoy while looking out upon the water. From an award-winning wine list and championship tennis courts, to one of the top conference centers in Southern California, Hilton San Diego Resort & Spa is the quintessential beach destination and retreat. We particularly appreciated their uncommon architectural design and interior décor, which achieves the Mediterranean ambiance of this waterfront oasis. Each guest room offers posh, yet refined bedding and linens, designer furnishings and an al fresco quality that draws in the daily sunshine and placid sea breezes. With studios and suites to choose from as well, you can enjoy a jacuzzi tub, walk-in shower, and an extended patio complete with a captivating fire pit. When you stay at The Hilton San Diego, you will have an opportunity to play tennis, go wake-boarding, or sail through the bay. If you’d rather get pampered than pumped, visit the spa to enjoy a revitalizing facial, a healing massage, or even a professional acupuncture session. Those travelers itching for a local adventure can rent a bike to ride along the boardwalk, to local beaches, or into San Diego’s famous Old Town district. Mission Bay water tours are also available daily, tourists can opt for a tour on a kayak, paddle-board or jet ski. No matter what brought you to San Diego, you can’t afford to leave without seeing it from the phenomenal vantage point that is Mission Bay. From any one of these awesome establishments, you’ll find yourself the perfect position to really take in Mission Bay and experience the best that San Diego has to offer travelers both weary and bored. Here action and adventure are just around the corner from peace and rest. While we were visiting Mission Bay for a business conference, we know that spending every extra minute we have on something personally fulfilling keeps our creative and innovative energy flowing. For this reason, for our community, Mission Bay was the best place for us to stay and we’re very thankful to our partners in sustainability who also happen to be in the hotel business.